Dan Chow focused on employee engagement in call centers among other sustainability projects. 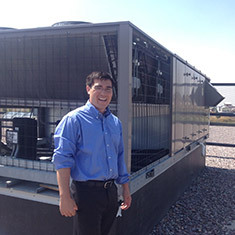 DIRECTV hosted EDF Climate Corps fellow Dan Chow during the summer of 2013 to work on a variety of projects. His projects included an assessment of renewable energy at DIRECTV’s owned & operated (O&O) call centers, creating guidelines around the environmental impacts at the O&O call centers, training call center “Green Teams” to boost employee engagement and serve as a communication path for management and performing research and providing feedback on a number of energy and environmental initiatives. The projects Chow worked on represent significant steps forward for DIRECTV in regards to its environmental, economic and cultural goals. The renewable energy project identified sites that have the potential for a favorable net present value. The sustainability guidelines will touch more than 5,500 DIRECTV employees. The Green Team trainings Chow led involved over sixty employees who will spread an environmental culture organically through activities and events. The energy efficiency projects he reviewed could save thousands of dollars and reduce greenhouse gases. Finally, the Department of Energy programs Chow evaluated could improve public awareness around DIRECTV’s environmentally friendly actions. Daniel Chow, a student at Duke University, was hired as the 2013 EDF Climate Corps fellow at DIRECTV .